It’s 2010, and Mexico is celebrating its dual bicentennial/centennial. The Mexican government has been planning the festivities for the past four years. The pace is picking up now since the actual anniversaries take place within the next few months. This may seem rather puzzling to those unfamiliar with Mexico’s complex history. What is being celebrated? How can 2010 be both a centennial and a bicentennial? An interesting feature of Mexican history is that the years of some key historical occurrences coincide with each other across the centuries. For example, Spaniard Hernan Cortes and his Indian allies defeated the Aztecs in 1521, laying the foundation for modern Mexico. Three centuries later to the year, in 1821, Mexico became independent from Spain. Even though Mexico became independent in 1821, the 1821 date is not remembered much today. It’s the 1810 anniversary, marking the beginning of what became the independence movement that is celebrated each year on September 15/16 (Mexican Independence Day). (In a somewhat similar, though not identical, fashion, the U.S. celebrates the 1776 date of the Declaration of Independence, and not a date in 1783 or 1784 when the independence-recognizing Treaty of Paris was signed and ratified.) 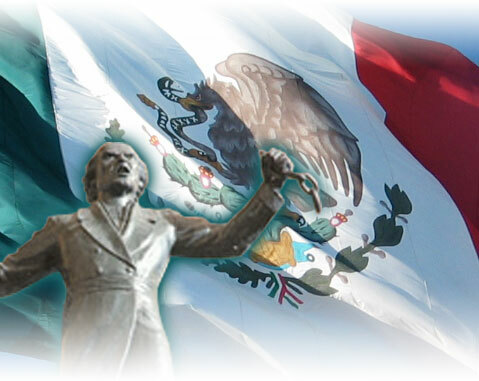 Thus in Mexican history, the 1810 anniversary is celebrated as Mexican Independence Day. And that leads us to another notable coincidence, that of 1810 and 1910. The Mexican Revolution began on November 20th, 1910. Therefore, by the standard reckoning, the calendar year 2010 marks both Mexico’s Bicentennial of Independence and Centennial of its Revolution, two historical periods separated by an intervening century. That’s the reason for the festivities and observances. It’s been calculated that over 700 activities related to the bicentennial/centennial are being held. The bicentennial/centennial is being marked by various cultural, artistic and educational programs. There are ceremonies, conferences, radio shows and art exhibitions. Mexican television stations are broadcasting related programming, and highways are marked with Ruta 2010 signs indicating historical routes. Besides the federal government, all 31 Mexican states and the Federal District (Mexico City) are holding observances. Furthermore, the celebrations are expanding beyond Mexico’s borders as Mexican embassies and consulates host related events in other countries. All in all, it’s a big celebration. There’s even a song, announced as the official bicentennial song, entitled El Futuro Es Milenario, written by Jaime Lopez and interpreted by various artists. The principal version has been recorded by Mexican pop star Raul Escajadillo, better known as Aleks Syntek. (This artist has been compared to Elton John, whom he physically resembles.) Nevertheless, there’s been some controversy over the “official nature” of the bicentennial song. Although the SEP (Mexican Education Department) announced it as the official bicentennial song, subsequently another SEP official said it wasn’t. Anyway, the song is out there, available on YouTube here. It’s catchy. The Bicentennial also involves the exhibition in a crypt of the earthly remains (now just bones) of 13 Independence heroes and one heroine. On August 15th these mortal remains were escorted by hundreds of Mexican soldiers to Mexico’s National Palace for display in a glass crypt. These remains had previously been removed (in May) from urns interred in the Mexico City landmark known variously asMonumento a la Independencia, the Columna de la Independencia, or El Ángel de la Independencia (photo here). They are to be returned there in 2011. According to an inscription on the monument, there were 12 individuals buried there, famous Mexican heroes of the independence movement whose names you can see on street signs throughout Mexico. Their names are Miguel Hidalgo (considered the father of Mexico), Ignacio Allende, Juan Aldama, Mariano Jimenez, Mariano Matamoros, Jose Maria Morelos, Javier Mina, Vicente Guerrero, Leona Vicario, Guadalupe Victoria, Andres Quintana Roo and Nicolas Bravo. However, after removing the remains, forensic investigators discovered that there were also two other, less well-known Independence heroes interred there, namely Pedro Moreno and Victor Rosales, who both died in 1817. It’s just that their names hadn’t been on the inscription. But now their remains are included in the crypt for public viewing. That means that when the remains are returned to the monument in 2011, the names of Moreno and Rosales should also be part of the inscription. The Mexican national anthem, in singing of Mexico’s defenders, calls for ¡Un sepulcro para ellos de honor! (A sepulcher of honor for them!). Moreno and Rosales certainly had a sepulcher of honor, but their names weren’t on it. Now, thanks to the Bicentennial, they should get their names on it too.